Braintribe with its category-defining smart data platform “tribefire” is re-writing the playbook for data. Tribefire integrates, translates and normalizes any kind of data to make it executable, extensible and expressive. According to their motto: “To bring life to data and data to life”. Braintribe provides the technology, tools and techniques for visionary enterprises to transform their businesses into digital powerhouses. Q·ADVISERS and Ithuba FinMill structured the deal and managed the investment process including carrying out the financial and legal due diligence for the investment consortium. fresh five* premiumfood specialises in the development and sale of high quality frozen yogurt and related products made with ecologically sourced ingredients. They sell under several retail brands – KISSYO, Schrozberger Milchbauern and Carlotta Vegan as well as white label for wholesale distribution. Q·ADVISERS structured the deal and managed the investment process including carrying out the financial and legal due diligence for the investment consortium. As principal investor our team managed the re-branding process of the frozen yogurt brand KISSYO and advised on building the distribution. In 2018 Q·ADVISERS successfully managed a capital increase of EUR 1.9mn for further expansion. PowerCigs is Germany‘s leading e-cigarette, vaporizer and liquids brand manufacturer . Q·ADVISERS structured the investment, managed the investment process including carrying out the financial and legal due diligence and negotiating the legal documentation. QC·PARTNERS is a BaFin regulated independent asset manager based in Frankfurt. Focus is on derivative investment strategies for offering institutional investors value-preserving and risk-mitigating alternatives to traditional equity and bond products. The investment concepts achieve significant added value on the market by generating alternative risk-return profiles. 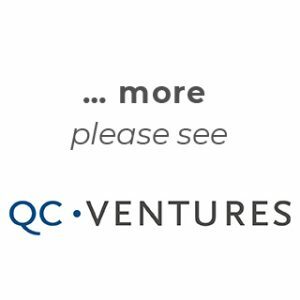 QC·PARTNERS was set up by Q·ADVISERS, its management and C-QUADRAT to acquire the Frankfurt based asset management advisory business of Kepler Cheuvreux. UCP Chemicals is one of the leading players in Russia’s chemical industry and is pursuing a dynamic growth strategy. UCP Chemicals offers attractive growth opportunities based on the expansion of its leading market position for synthetic resins, ongoing product innovations and the penetration of new markets. The Gotlandhof Berlin is a sizeable residential real estate project of Hubertus Hiller, Harald Wengust and Fritz Schweiger. 136 condominiums are built at Prenzlauerberg Berlin. The architecture follows Scandinavian examples – bright, light and reduced to the essentials. The building was finished in 2018 and all apartments have now been sold. informica real invest is a German real estate manager and developer who owns a broad residential portfolio in various major German cities. It is majority owned by Q·REAL ESTATE. Informica’s team in Würzburg and Vienna provides asset management services for the German real estate assets. Q·ADVISERS structured the deal and managed the investment process including due diligence. Q·ADVISERS, informica real invest and partners invest in a small residential portfolio in Leipzig. Informica real invest finds and manages the properties, analyses the investment and executes the transactions. The portfolio as of end of December 2017 consists of five properties with an area of 4,160 m², 64 residential and two commercial units. Q·ADVISERS partners participated in a small high profile development at the waterfront in Köpenick, one of Berlin’s most desirable residential areas: 1,700 m² residential properties (16 apartments) and 16 parking spaces. The flats were sold according to plan. VARTA is a German-based producer of battery solutions with a leading global position in micro-batteries for hearing aids and a growing footprint in lithium-ion batteries for the entertainment market. Q·ADVISERS advised the main shareholder of VARTA on the company’s IPO and listing at the Frankfurt Stock Exchange in 2017, with a total offer size of EUR 233mn of which EUR 150mn capital increase. 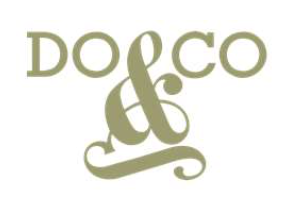 DO & CO is an Austria-based premium airline and event caterer with global operations. Q·ADVISERS advised DO & CO on the first ever dual listing of a foreign company on the Istanbul Stock Exchange together with a capital increase of an international offering of EUR 68mn in 2010, the placement of 10 % of the outstanding shares (EUR 47mn) on the Vienna Stock Exchange in 2014 as well as on its investor strategy and various M&A opportunities. Warimpex is a real estate developer and hotel operator with a property portfolio in Central and Eastern Europe and Germany. Q·ADVISERS advised Warimpex on several bond and equity issues totalling approx. PLN 130mn (over EUR 50mn) including the first ever convertible bond issue by a foreign company on the Warsaw Stock Exchange in 2010, a public offering of straight bonds in Poland and a private placement of a convertible bond to Polish and international institutional investors in 2013. Berndorf AG is the holding company of a group of globally active small- and medium-sized industrial companies specialised in among others toolmaking, automotive, heat treatment, belts and belt systems, and press plates. Q·ADVISERS advised Berndorf on potential M&A opportunities. Q·ADVISERS advised Treppides Investments & Holding Ltd. on the acquisition of SWAN Office and Technology Park, a Class “A” office development with 29,124 m² of leasable area, located in Bucharest’s northern business district of Pipera-Tunari. The property was being sold in a tender process as part of an insolvency procedure. C-QUADRAT is an international asset manager focusing on active and passive investment strategies. 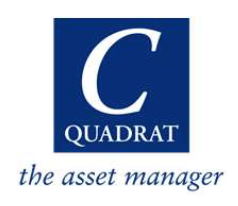 C-QUADRAT operates in more than 20 countries and has recently EUR 8bn assets under management. Q·CAPITAL is one of the long-term strategic shareholders of the formerly listed company together with C-QUADRAT management and founders. Group Investment Company Q·CAPITAL AG has sold its remaining stake in C-QUADRAT to the majority owners in 2018. WOOD & Company is a leading independent regional investment banking specialist with around 150 employees across five regional offices and an international distribution hub in London. FJS Capital Holding engaged with a stake in 2010 and after a few years of Fritz Schweiger’s active involvement as a board member exited in 2014.